Just read a wonderful review of The Hobbit: The Desolation of Smaug. It is an upcoming release, and oh man (!) am I excited after reading this. Do read if you want an overview and a sneak peek of what’s coming to us in the film that is scheduled to be released next week. Be warned if you read past the first paragraph, spoiler alert! 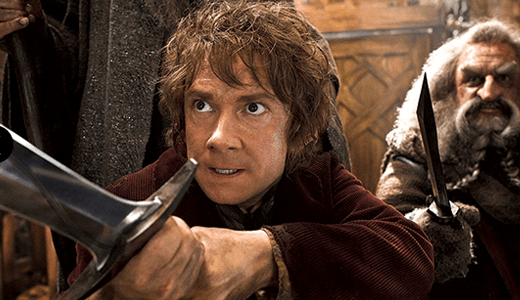 In Peter Jackson’s latest Hobbit film, you can look forward to a more fast-paced story line. Indeed, I found the film very energetic, without a dull moment. While there are many scenes I loved in J.R.R. Tolkien’s novel that played out as I had envisioned them, there were quite a few serious changes to the storyline I was not prepared for, nor do I think those that consider themselves Tolkien “purists” will be happy about them. However, there were many familiar moments within The Desolation of Smaug that die-hard Lord of the Rings fans will very much appreciate. The following is a very detailed run-through of the film and its story line. I understand that not everyone will watch the film and have the same reactions I had, so I encourage you to go see the film once it’s out in theaters and judge it for yourself. The very first scene in DOS is a flashback, and it opens on a familiar setting–a cold wet Bree, including a carrot-munching Peter Jackson who saunters by the camera. Inside the Prancing Pony, Thorin is joined by Gandalf who convinces him to take back Erebor. I’m still undecided on whether the Bree scenes held too much familiarity or not. Back in the “current” time frame, Bilbo is on the lookout for Azog when he spies something even more sinister–an animal in the shape of a large bear. After relaying his findings to the group, Gandalf realizes the bear is in fact Beorn. Knowing he’s tracking them, Gandalf runs and orders them all to follow him. Bilbo Baggins has changed much since we last saw him in The Hobbit: An Unexpected Journey. He seems to have come to grips with the evil around him and readily jumps into fights, kills orcs, and saves dwarves. At the same time, he struggles with the growing power The One Ring has begun to have over him. Mirkwood was a very good example of that, and I thought Jackson and his team pulled off those scenes perfectly. Well, all except that moment between Tauriel and Kili, but let’s not get ahead of ourselves just yet. AUJ spent so much screen time convincing us of just how evil Azog is, that it was weird not to see much of him in DOS. At the very beginning of the film, Azog is summoned to the Necromancer who orders him to quit chasing the dwarves and start building him an army. Unable to let Thorin and Co. get off so easily, Azog orders his son Bolg to continue hunting the dwarves. I feel like the phrase, “Bolg is the new Azog,” would go really well here. When the first images of Beorn where released, many Tolkien fans panicked. I mean, come on, mutton chops? Really? But, I am happy to report, I was pleasantly surprised with how Beorn’s manner and character came across the big screen. I found myself studying his eyes, which are huge, brown, and…well, bear-like. Beorn’s house and its design leave nothing lacking, and I applaud Dan Hennah and the design crew for their meticulous attention to detail. With the group being pursued by Beorn in bear form, Gandalf leads them to the shape-shifter’s house, and not a moment too soon, as he nearly manages to break in before they close the door. While Thorin and Co. stay at Beorn’s house, we find out that he is the last of his kind. The rest of his kin have been caught by Azog and have either been killed or thrown into arenas to fight each other to the death. I was disappointed by that change, as it seemed to lessen his power somewhat if every single one of his kin could be caught by one orc. Still, I enjoyed Beorn and his interactions between Thorin and Co. so much that I was sad those scenes were not longer. Gandalf is much the same as he was in AUJ, only he is growing more concerned about this “Necromancer” he’s been hearing about. At the outskirts of Mirkwood, he finds a painted red eye that compels him to leave Thorin and Co. to go investigate the origins of the Morgul blade Radagast found in AUJ. He ends up at the tombs of “The Nine,” where he “calls” Radagast to join him. Together, they find that each tomb has been broken open by whatever was buried there. 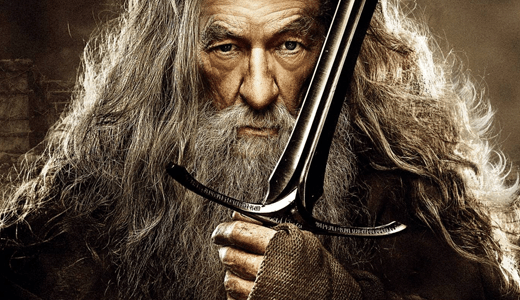 Feeling the need to investigate further (and to waste time in order to fill the space need to make three movies), Gandalf decides he alone must go into Dol Goldur and face whatever enemy he finds there. In the film version of Mirkwood, there is no poisonous stream that Bombur falls into that causes him to sleep. Instead, the very air Thorin and Co. breathe is toxic and causes severe hallucinations, which honestly, caused me to feel like I was hallucinating by the time the dwarves got caught by the spiders. Speaking of which, we do hear the spiders talk amongst themselves, but only when Bilbo puts on The One Ring to save the dwarves from being eaten. The Mirkwood visual effects were amazing, and I totally got the creepy crawlies watching those giant spiders crawl around on screen. If you’re more a film fan than a book fan, this news might not affect you as much. However, if you label yourself a “Tolkien purist,” make sure you’re sitting down. Yes, all the rumors are true. There is a love triangle between Tauriel, Kili, and Legolas. The first time this occurs is in Mirkwood, soon after Bilbo cuts the dwarves free from their spider cocoons. Kili is very nearly killed when Tauriel bursts on scene and saves his life. Kili is awestruck the moment he sees her, and he looks at her much the same way he eyed the elves in Rivendell in AUJ. 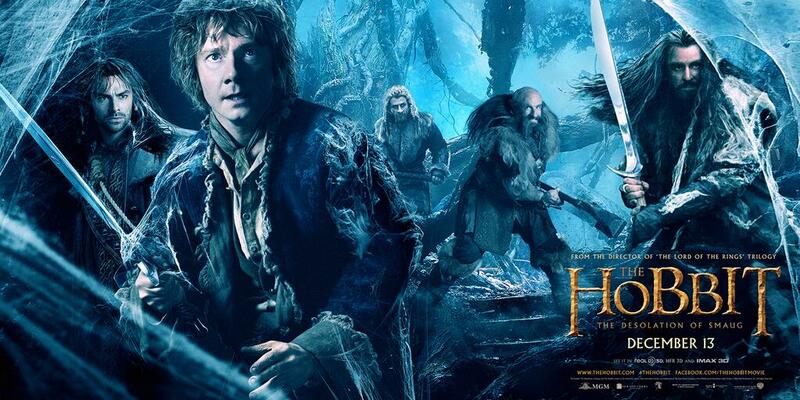 Captured by Thranduil’s guards, Thorin and Co. are taken to the elven king’s dungeons. Unbeknownst to the elves, they’ve been followed by a ring-wearing hobbit, who sneaks in unseen. As Bilbo sets himself to the task of creating an escape plan, Thorin is taken to Thranduil, and the two finally face off. Both kings are proud and neither gives in to the other’s demands. No deal goes through. Even though Thorin’s pride leaves them stranded in the dungeons, there’s a wonderful moment where we see his faith in Bilbo has grown, and he trusts Bilbo will help them escape. Meanwhile, Tauriel pays Kili a visit in the dungeons, and the two love birds chat it up about life, traditions, and stars. It isn’t till Tauriel leaves Kili that we see a very jealous Legolas watching them from afar. With a plan of escape in place, Bilbo manages to free the dwarves and convince them to crawl into wine barrels without giving them a reason why. The whole scene is hysterical, especially when Bilbo releases them into the river only to realize he’s forgotten to save a barrel for himself. The fun continues as the elves soon find out Thorin and Co. have escaped. Legolas and Tauriel pursue the escapees only to find Bolg and his crew have finally caught up with them as well. So much happens on screen during the barrel-riding scenes that your eyes will hurt. Bombur is particularly funny, so keep an eye out for him in all the commotion. And let’s not forget Legolas, who performs all kinds of impossible stunts, all very reminiscent of LOTR. The fun, however, takes a turn when Kili gets shot by an arrow. Still, the dwarves (and Bilbo) manage to escape the orcs and the elves and head down stream. 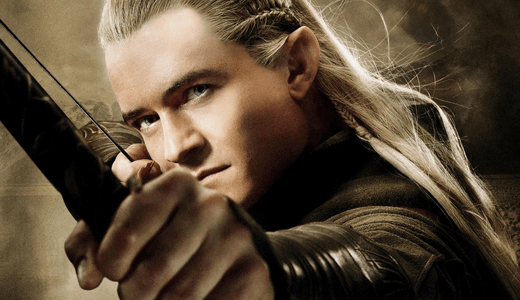 With one orc as prisoner, Legolas and Tauriel head back to Thranduil, where the orc is questioned. This is where we find out the arrow Kili was shot with was a Morgul arrow and that if left untreated, he’ll die. Don’t worry, it gets weirder. Tauriel leaves to save Kili, and when Legolas finds out, he defies his father’s orders and goes after her. 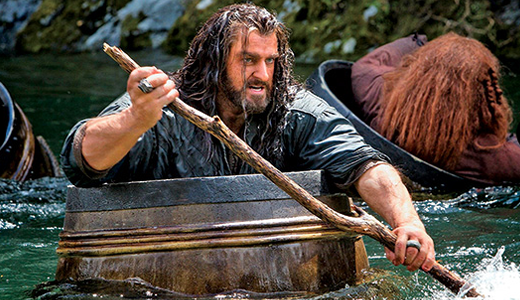 Thorin and Co. ride the river until eventually they lose the current and end up running into Bard. 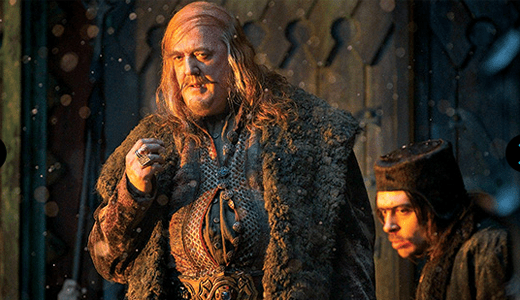 There are some humorous lines exchanged as the dwarves try to convince Bard to help smuggle them into Laketown. Grim faced, Bard agrees to their terms and sails them towards town where he eventually has to cover them with fish in order to hide them. To make matters more humiliating for the dwarves, they end up having to come up through Bard’s toilet in order to sneak past those watching Bard’s house. I loved Laketown. It is one of the few places the music really struck me, and the set design is just spectacular. The Master of Laketown and his counselor Alfrid are absolutely disgusting– just the way I pictured them when reading the book. Unfortunately, that’s where my awe ended. So many things part from the book in Laketown, that I found myself dizzy trying to accept it all. Not all the dwarves head to Erebor, for instance. Kili’s wound worries Thorin and he orders him to stay behind. Not able to leave his brother’s side, Fili decides to stay in Laketown, as well. And then there’s Bofur who, after a late night of drinking, wakes up late and misses the boat to Erebor. The three dwarves are taken in by Bard’s children, as Bard has been thrown in jail for not cooperating with The Master. Kili’s wound takes a turn for the worst, and Bofur leaves to find kingsfoil. That’s when Bolg and his crew show up again, as well as Tauriel and Legolas. After some fighting, Tauriel goes Arwen on us and heals Kili with kingsfoil, elvish words, and glowing light. Now on the mend, Kili is head over heals in love, and he and Tauriel hold hands for a few moments. No, I am not making this up. Meanwhile, a very annoyed Legolas has been left to fight Bolg on his own. Bolg manages to cut Legolas every so slightly on the upper lip, and enraged, Legolas mounts a white horse and rides after him. Just as Radagast had guessed, a trap awaits Gandalf in Dol Goldur, and soon the wizard is running all over the ruins fighting Azog and his crew. That is, until he runs into the Necromancer. The scene took me back to The Fellowship of the Ring, where Saruman and Gandalf have their wizard battle and again when he fought the Balrog. This time, however, we get a black fog fighting Gandalf. Using his staff, he creates a white bubble of light to overcome the Necromancer, only he fails several times until he is eventually pinned up against a wall. There we get a very trippy Sauron eye flash on the screen about a million times. 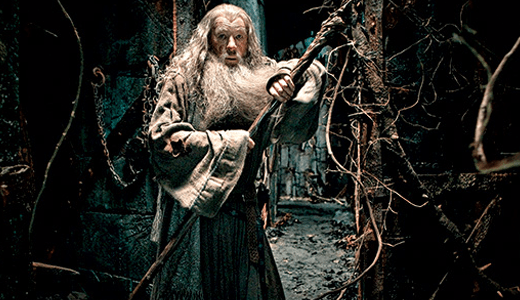 Finally, we see Gandalf has been caught, and is being held in a hanging cage in Dol Goldur. Three dwarves short, Thorin and Co. sail from Laketown to Dale and then make the climb to Erebor, where they wait for the sunset to reveal the key hole to the secret entrance. The sun goes down, nothing happens, and it takes all of two seconds for every single dwarf to give up the entire quest. Left alone, Bilbo stands there pondering what to do when the moon shines down on the stone. A key hole is revealed, the dwarves return, and they finally enter the Lonely Mountain. Now inside Erebor, Bilbo is sent on his biggest quest: find the Arkenstone. I enjoyed this part of the film so much that I hate to give too much away. The conversation between Smaug and Bilbo is brilliant. Smaug is proud, smart, and 100% dragon–just what I was hoping for. All throughout their conversation, Bilbo is humorously trying to nab the Arkenstone, which he spied among the gold. However, we are never shown whether or not he ever managed to get it. In the end, Smaug tires of Bilbo and decides to turn him into BBQ Hobbit. Eventually, a running Bilbo is joined by Thorin and the other dwarves, and so begins the long chase through Erebor. After much running, Thorin comes up with a plan. Using Smaug’s own flames, they heat up the old furnaces and lead the dragon to the throne room. There, they lure him to a large casting mold. The now heated furnaces pour liquid gold into the mold and as soon as Smaug approaches it, the dwarves release the mold casting to reveal a golden statue of Thror. Taken in by the sight of so much gold, Smaug pauses, but the casting has not fully cooled, and the gold suddenly bursts, covering Smaug in a river of gold. Everyone breathes a sigh of relief but soon regrets it, as Smaug breaks through the surface, now covered in gold. Now angrier than ever, Smaug heads for Laketown, bent on it’s desolation. The end of the film leaves Kili, Fili, Bofur, Bard, and Tauriel in Laketown, Legolas off hunting Bolg, Thraunduil held up in his wooden kingdom, Gandalf captured by the Necromancer, Smaug flying for Laketown, and the rest of Thorin and Co. regretting their decisions. As “I See Fire” began playing as the credits rolled, I found myself not wanting the story to end there, so I know I’ll be back this time next year anxiously awaiting The Hobbit: There and Back Again. Make sure to stay for the credits, as there’s a particularly delightful song that follows “I See Fire.” It is, in my opinion, the true essence of Middle-earth. It’s an entirely new sound, and yet it holds the same magic and wonder Howard Shore’s LOTR soundtracks have. Too bad neither AUJ or DOS did not incorporate more songs like “Beyond the Forest.” Dare I hold out hope for The Hobbit: There And Back Again?